Summary First QCA based AC1750 Class router, with Gigabit ports. I bemoaned NETGEAR's use of 10/100 ports on its R6100; the first Qualcomm Atheros (QCA) based draft 11ac router to hit the SmallNetBuilder test chamber. So when I saw both TP-LINK and D-Link had fully Gigabit-equipped QCA-based routers close to launch, I got in line for my samples. I'll preface this review by saying we discovered wireless performance problems with both TP-LINK's Archer C7 and D-Link's DGL-5500 that we reported back to them. And both companies have new firmware in the works to straighten things out. But since both products are on the shelves waiting for you to open your wallet, both are fair game for review. 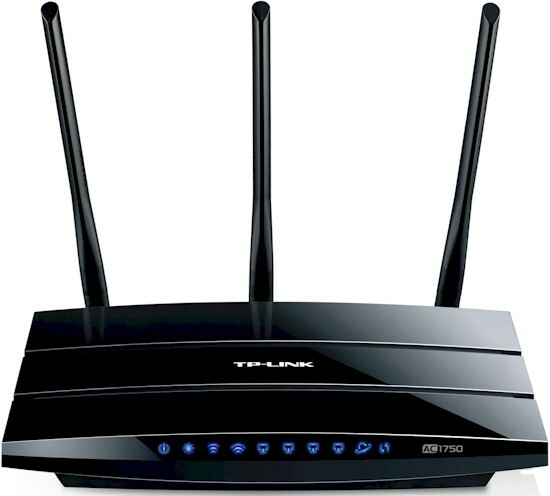 TP-LINK's Archer C7 might be mistaken for its N750 class TL-WDR4300 sibling, which is the top of the company's N router line. The black high-gloss plastic exterior starts to collect fingerprints immediately after you peel off its protective film, giving it a well-worn look almost immediately. Antenna-upgraders will be happy to see that the three 5 dBi external dipole antennas are attached via RP-SMA connectors for easy upgrading. But their joy may be reduced when they discover that the external antennas are 5 GHz only. The three 2.4 GHz antennas are ensconced discretely inside the router. You can peruse the callout diagrams below to get the 411 on the lights and ports. As noted earlier, all Ethernet ports are Gigabit. The two USB ports are 2.0 only, however. TP-LINK has thoughtfully included a wireless on/off switch for folks who like the extra security that comes from shutting wireless completely off when you don't need it. I was able to easily pop the C7's hood to take the photo below, which clearly shows its QCA based design. No heatsinks were removed to take this photo. Unlike most Broadcom-based AC router designs, this one apparently doesn't need them. The three bent-metal 2.4 GHz antennas are clearly visible in the photo. The C7's key components are summarized in Table 1. Component-wise, the C7 sticks very close to QCA's QCA9005AP 802.11ac reference design. Note that the Archer C7 is the only QCA based AC1750 class router available to date. D-Link's DGL-5500 is only AC1300 class, substituting a QCA9882 2x2 802.11ac radio on the 5 GHz side. Another key difference between the two is that the D-Link includes QCA's StreamBoost intelligent QoS that is based on technology acquired in Qualcomm's Bigfoot Networks purchase. The C7 does not include StreamBoost, opting instead for simple bandwidth-based, but bi-directional QoS.